Arsenal Pulp Press, 9781551525921, 256pp. 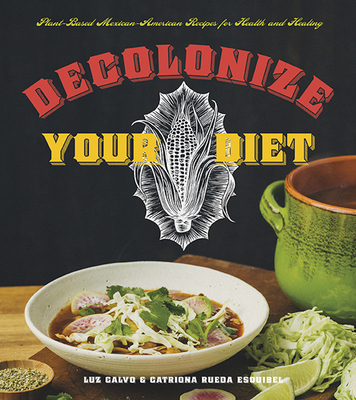 More than just a cookbook, Decolonize Your Diet redefines what is meant by "traditional" Mexican food by reaching back through hundreds of years of history to reclaim heritage crops as a source of protection from modern diseases of development. Authors Luz Calvo and Catriona Rueda Esquibel are life partners; when Luz was diagnosed with breast cancer in 2006, they both radically changed their diets and began seeking out recipes featuring healthy, vegetarian Mexican foods. They promote a diet that is rich in plants indigenous to the Americas (corn, beans, squash, greens, herbs, and seeds), and are passionate about the idea that Latinos in America, specifically Mexicans, need to ditch the fast food and return to their own culture's food roots for both physical health and spiritual fulfillment. This vegetarian cookbook features over 100 colorful, recipes based on Mesoamerican cuisine and also includes contributions from indigenous cultures throughout the Americas, such as Kabocha Squash in Green Pipian, Aguachile de Quinoa, Mesquite Corn Tortillas, Tepary Bean Salad, and Amaranth Chocolate Cake. Steeped in history but very much rooted in the contemporary world, Decolonize Your Diet will introduce readers to the the energizing, healing properties of a plant-based Mexican American diet. Luz Calvo and Catriona Rueda Esquibel are professors at California State East Bay and San Francisco State University, respectively. They grow fruits, vegetables, and herbs on their small urban farm. This is their first book. Luz Calvo: Luz Calvo is a professor of Ethnic Studies at Cal State East Bay. Luz and their partner Catriona Rueda Esquibel live in Oakland, CA, where they grow fruits, vegetables, and herbs on their small urban farm as they study traditional Mesoamerican cuisine.Catriona Rueda Esquibel: Catriona Rueda Esquibel is an associate professor in Race and Resistance Studies at San Francisco State University. Catriona and her partner Luz Calvo live in Oakland, CA, where they grow fruits, vegetables, and herbs on their small urban farm, as they study traditional Mesoamerican cuisine.